My family and I will have a trip to US on April 22 and we will transfer for our tour in South America, basically it’s Peru, Chile and Brazil. Our last day on in South America is May 17 and we will arrive in the US at night. Our flight back to our home country (Philippines) is on May 20. We decided that we are going to Six Flags on either two of these dates May 18 or 19. Both of these dates are Ghost Towns based on the crowd calendar. The question is …. Do we still need to buy Flash Passes? Also a final date decision for May 18 – 19? Time? You must be thinking: Im smart or you think I am lying or something. But I am smart! I just graduated. Also I was the valedictorian in my school. Going to the Americas was my parents’ gift to me. Ohh I almost forgot, is there a height or age security for the rides because I hate being rejected from a ride? I’m either young or not tall enough. I’m actually tall for my age for a Filipino Kid I’m 5’3. Anyways thank you very much and have a good day!! You shouldn’t need Flash Passes on those days. I think May 18 would be better, but there shouldn’t be too much of a difference. You’re tall enough to get on all the rides and there’s no age restriction. Have fun! Thank you very much Robert!! You’re the best!!! Have a good one! We are looking at visiting the park and trying to figure out the best time to come 31st may – 3rd of june 2016 as we don’t want to go on a very busy day. Or would you recommend to get the flash pass? Hi, I am planning on visiting the park on Tuesday 3rd may? Is this a good time to visit? Will I need flash passes to get on all the rides? What will my average wait time be?? I think Tuesday-Thursday would be best. Flash Pass shouldn’t be necessary on those weekdays. Yes, that’s a great time to go. Flash Pass shouldn’t be needed. It’s not uncommon for there to be no lines around then. I’m going this weekend, on April 16th! It’s my birthday, should I expect it to be super busy? Saturdays are always fairly busy, but I don’t think it will be too crazy since the Spring Break season is over. Get there early! 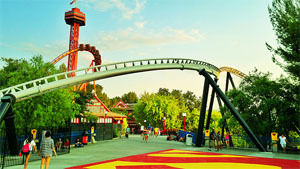 I want to take my son there for the first time for his 10th birthday which is May 15. Is that a good day to go?